America used to be community-minded. Is it too late to rekindle those values? 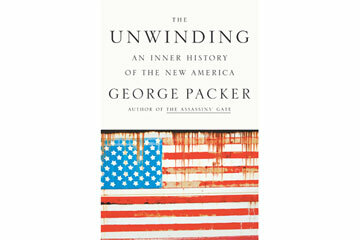 The book jacket of The Unwinding by George Packer. My favorite character in George Packer's remarkable new book, The Unwinding, is a real estate development in Tampa called Carriage Pointe. I especially like the way it is spelled--that e conveys a certain French elegance. One imagines antebellum carriages rolling up to your very own promontory. But no: Carriage Pointe is a mirage, part of the housing boom based on mortgages that couldn't be paid. Too many of the unoccupied dwellings were owned by speculators--flippers--riding the real estate elevator that ultimately crashed. The houses, built on a sodden former tropical-fish farm, are "crappy," Packer writes. The metaphor is perfect: over the past 40 years, as the U.S. has unwound from its former rigor, facade has overtaken content, speculation has overtaken development--and in my profession, slapdash opinion has deluged dogged reporting. The middle class is sliding toward dissolution. The wealthy have become an isolated plutocracy. If it weren't for the fact that this is America, I'd say we were pretty thoroughly cooked. The unwinding, a nonfiction account of the past 40 years told through the lives of average and not-so-average Americans, appears at a particularly fraught moment. I read Packer's book with one eye on Washington this spring. There was some hope, a few months ago, that we might actually get a budget this year. Both houses of Congress passed a version; it was time to hammer out the final deal. But the Republicans, following a Carriage Pointe strategy--nonsense posing as substance, nihilism posing as principle--have blocked any sort of negotiations. They have focused instead on nonscandals--even South Carolina Senator Lindsey Graham has said that there is no evidence linking the White House to the idiotic shenanigans at the Internal Revenue Service. The most prominent Republican to emerge this spring is the sketchy Darrell Issa of California, chair of the House Oversight and Government Reform Committee, who seems like the political equivalent of an empty subdivision--lots of fancy signage but nothing of value on offer. It is impossible to read The Unwinding without thinking about what is not being discussed in Washington. There is no discussion of the overwhelming power and moral hazard of the five largest banks, which hold assets equal to 56% of the total U.S. economy and remain too big to fail. There is no discussion of the destructive growth of the financial sector, which is siphoning off our smartest young college graduates to create ever-more-complicated (and less substantive) investment schemes, like the collateralized debt obligations that crashed the market in 2008. There is little discussion of the decline of the middle class beyond the clich*-slinging of both sides: Where do we find the work to replace the factory jobs that sustained a prosperous middle class prior to the unwinding? What do we do about the unraveling of middle-class values, the skyrocketing of out-of-wedlock births and the 20% high-school-dropout rate now metastasizing from the urban poor to the working class? Where do we find moral authority in a society that, as Packer writes, celebrates an unapologetic former crack dealer like Jay Z?